Between 1936 and 1937 the Hornchurch Squadrons were again re equipped, this time with Gloster Gauntlets. By this date, construction at RAF Hornchurch was near enough complete with three big C Type hangars and an extensive technical area with associated officers housing and mess, airmen's accommodation and an airmen's institute. 1936 also saw RAF Hornchurch receive a third squadron on establishment, this time 74 Squadron. It was also in 1936 that RAF Hornchurch had its status raised to a Sector station belonging to the newly constituted 11 Group. For this RAF Hornchurch was equipped with the latest in fighter control technology including an underground Operations and plotting room. By the end of 1936 RAF Hornchurch was already the home for a select group of airmen who were to make names for themselves during the Battle of Britain. These included Robert Stanford Tuck, William Franklin and Percy Morfill of 65 Squadron, Adolph “Sailor” Malan of 74 Squadron, Cecil Bouchier commanding 54 Squadron, and Donald Finlay. Donald Finlay also made a name for himself by claiming silver in the 110 m hurdles at the 1936 Berlin Olympics and as captain of the British Olympic team in 1948. In 1937 the Hornchurch squadrons, starting with 54 and 65 Squadrons were gradually re-equipped with the new Gloster Gladiator, the last Biplane fighter to enter service with the RAF and the first to be fitted with an enclosed cockpit. Meanwhile in Spain the new German monoplane fighter, the Messcherschmitt 109, was already being tried in combat by Luftwaffe pilots flying with the Condor Legion in support of General Franco's Nationalists. As a terrible foreshadowing for what was to come German pilots were also demonstrating in their sleek new monoplane Stukas and Heinkels the awful results of the bombing of civilian targets. It was to this awful backdrop that in October of 1937, Hornchurch played host to a visit by senior Luftwaffe figures including the World War I ace Ernst Udet. It is recounted how during this visit, that before astonished RAF pilots, a senior RAF brass hat calmly ran over the finer points of the new, and secret, reflector gun sight with the German party. There were, however, occasional breaks for levity during the more serious preparations for the coming war that most of the pilots expected. 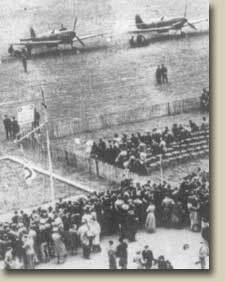 These included the Empire Air Day displays at Hornchurch which attracted 17,000 spectators in 1937. In addition 65 Squadron was given a supporting role in providing the aerial footage for a Hollywood film, The Shadow of the Wing. The 1938 Empire Day at Hornchurch saw the first public demonstration of the new Hawker Hurricane fighter, the RAF's first monoplane fighter. This Empire Air day was also visited by the World famous woman aviator and round the world flyer Jean Batten. In June of 1938 the serious business of preparing for war returned when 11 Group, and RAF Hornchurch were put through a rigorous full sector mobilisation and war exercise. This involved alerts, air raid drills, mock air attacks and interception exercises. In September 1938, Europe teetered on the verge of war over Hitler's annexation of the Czechoslovakian Sudetenland. During this period (known as the Munich crisis) Hornchurch was placed on full scale war alert and the Hornchurch Squadrons were ordered to paint their aircraft in camouflage colours. Munich is usually described as a failure but it must be remembered that Britain was still woefully unprepared for war. Although it had very severe repercussions for Czechoslovakia, the breathing space given by the Munich agreement meant that the RAF would be dragged into a war a year later, by which time its front line squadrons would be equipped with state of the art monoplane fighters, including the Spitfire and Hurricane. The Hornchurch squadrons were amongst the few initially selected to fly the superlative new Spitfire, the first of which flew into Hornchurch on February 13th 1939. There was to be one final Empire Air day in May 1939 which was attended by an impressive 45,000 spectators. Again a world famous aviator was in attendance, this time the air racer Alex Henshaw. Events in Europe were, however reaching an almost inevitable conclusion. With tensions rising RAF Hornchurch was put on full war footing on 22nd August 1939. The new Spitfires were dispersed in their protected pens around the airfield perimeter. Alongside the dispersal areas bell tents were erected to house the ground crews and the local Home Guard took up post manning the airfield defences. By this date RAF Hornchurch also had two satellite airfields attached to it to aid dispersal and provide forward airfields. These were RAF Manston on the Kent coast and RAF Rochford. In the early hours of September 1st 1939 Germany unleashed it's Blitzkrieg (Lightening War) against Poland. On September 3rd 1939 Britain declared war on Germany. RAF Hornchurch was at war.